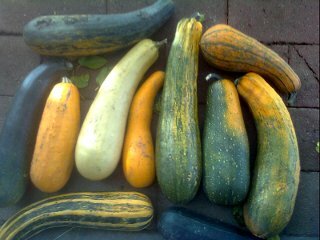 I have harvest seeds from large squash, Joseph's landrace variety, but when dried they are shriveled up raisins, or soft. They don't look right. Do I need to wait longer? Should I ferment them for a few days like other seeds? I typically allow summer squash to get very big before harvesting. That is more than a month after they are at the tender-eating stage. By then, crookneck will have a hard shell around them. Zucchini will be huge! I typically time my harvest to coincide with the fall frosts. By then, a typical green zucchini will be turning orange. In other words, I allow them the maximum time possible on the plants. Thank you. I have 1 large one now, a few small on the way. Given how fast they get big, I should get at least a few. I have 4 of your plants going, and I'd like to get seeds from at least one fruit per plant.